Continuing the ongoing series of interviews with creative artists working on various aspects of movie and TV productions, it is my pleasure to welcome Mikhail Krichman. In this interview we talk about the start of his career in the early ’90s that coincided with the big political changes in Russia, his ongoing collaboration with Andrey Zvyagintsev that included the Oscar-nominated “Leviathan”, how stories cross cultural borders and how stories can change dramatically when they are told in a different language (dubbing or voiceover), and the transition of the industry from film to digital in the last decade. The second half of the interview is about Mikhail’s work on the wonderfully crafted world of the recently released “Miss Julie”. Mikhail Krichman on set. Photography by Anna Matveeva. Kirill: Please tell us about yourself and how you got into the industry. Mikhail: It happened almost accidentally. My parents come from the field of book typesetting. After finishing my army service I didn’t know what to do with myself, and I chose the easiest path. I wouldn’t say that it interested me that much, but I didn’t know anything else. I spent a lot of time in printing houses, and I liked the smell of the paint. Those were the things from my childhood that made me start my studies at what is now Moscow State University of Printing Arts. It was around 1991. They had an arts department, but since I didn’t have any drawing skills, I didn’t have any thoughts about doing graphic design. I joined the department of technical studies, learning about the technology and the process of book printing. After third semester I moved to an extramural study program and started doing part time jobs. Those didn’t have any connection neither to what I do now nor to what I was continuing to study, and from what I remember from those activities, I might have even lost money doing them. And it so happened that I met a guy that was about to graduate from the cinematography department of the Gerasimov Institute of Cinematography. It was a birthday party, and I asked a question that probably a lot of people ask in a similar situation – would it be possible to visit a set and see how things work when they shoot a movie. We talked for a bit and then he disappeared, and I almost forgot about him. Then after a year he got in touch, saying that he had an opportunity for me to come and visit a set. That was how I saw a film set for the first time – as he was directing and shooting some kind of a commercial. But that’s not how I started my path to becoming cinematographer. A bit later, again with the help of the same guy, I visited the editing room of a TV station. Back in the 1990s it was simply possible to go there and enter the buildings. The editing room was empty apart from one day a week. It was full with Betacams and mixing consoles, and I remember myself spending day after day reading the manuals, learning how different machines worked, trying to mix source materials that didn’t even belong to me. And after some time I became a junior editor. Kirill: Without having some kind of a formal education in the field. Mikhail: I noticed the people who knew what they were doing in the editing room, and started learning from them. It wasn’t overly difficult, and my boss saw that I wasn’t all that bad, so he kept me around. After a while I had a chance to sit through a number of study groups led by a teacher from the Gerasimov Institute of Cinematography. She was teaching courses on editing, and my boss invited her a few times a week to give lectures to me and my colleagues. She talked mostly about editing film, and it was a free-form dialogue. We didn’t have any strict plan, and keeping notes was optional even though we all kept detailed notes. She was a great teacher, and I learned a lot from her, things that stay with me until now. I’ve spent around three-four years there, and then found the next step in my career. I met Leonid Kruglov who was doing a travel show for a national TV station. He invited me to Cuba to make a documentary with him, which was my first job in doing documentaries. It was only him and me, making a show about Santería and their religious beliefs. Right around that time we had first appearances of small hand-held digital cameras from Sony. Betacams were already around, of course, but they were bulky and expensive, confining them to studio environments. The small digital camera that we had cost around $3,000 and we also got a wide lens, starting to experiment with this new hardware and what it allowed you to do in the field. It was amazing at the time. I also started doing music clips, as directors liked that I was both shooting and editing the material. And I kept on doing that travel show, going with a slightly bigger crew of five and two cameras. We did Papua New Guinea, Brazil, Colombia and Peru among the rest. That was already 1999. And then in 2000 I met Andrey Zvyagintsev that worked at REN TV at the time. He got offered to do “The Black Room” show, choosing a few short stories to shoot. He was looking for cinematographers to shoot individual episodes, and one of my director friends put us in touch. Kirill: And you continued working with him afterwards. Mikhail: Yes. We did those three short stories, each one 25 minutes long and not related to the others. The show was received well, and I was contacted by a film studio to do my first full feature, “Binge Theory”. Then I did “Sky. Plane. Girl” in 2002. Kirill: I remember the years after the collapse of Soviet Union, where a lot of industries underwent very big changes, as what was controlled by the state and the party was now transitioning into private hands. What was the state of the film industry in Russia around 2000? Mikhail: The industry lost a lot of talented people, key people across all departments, including second unit directors, camera operators and script writers. People lost their jobs during that period, going to other fields that didn’t even have much connection to arts. Some went abroad and some just disappeared. I wasn’t a big fan of Russian cinema at the time. I remember seeing differences in the artistic and visual quality of American, British and French films. I was also younger, and American movies were much closer to my taste as well. I can’t remember a single local film from the ’90s that had left a powerful impression on me. There were a few indie films that failed to deliver on their promise, and a lot of them went nowhere. Also, due to lack of budget, most of them were not done that well compared to european or American productions. I think that aesthetics are an important part of making a film. When the form is untidy and messy, the content is sometimes lost. And that was struggling to pull their weight against the smooth form of the American films. It feels that only now I am starting to discover Russian cinema. Andrei Tarkovsky was a formidable figure. I might not have been able to appreciate his content at the time, but the form was powerful. Kirill: How do things look like in the local movie theaters as Hollywood aims to be a global producer of blockbuster movies? Is there some kind of competition between the local and American movies, or is it more of a coexistence? Mikhail: I wouldn’t say that it’s an avalanche, but we definitely have a lot of American movies playing here. I think they outnumber the local productions, but I can’t say if it’s good or bad. There’s a line of thinking that says that if the industry is making money overall, that’s good. I don’t know if government-mandated measures to support local cinema works, like it was in France in the 1960s. Back then local theaters were required to show local films, and it was one of the reasons for the advent of the French New Wave. Perhaps the truth is somewhere in the middle. The question of what should Russian cinema be today is an interesting one. Should it mimic Hollywood productions? There’s just simply not enough financing to do that, so it’s useless. And doing niche productions is not the right answer as well. We should try different things, with directors and producers exploring various genres. Sometimes it works. The local Russian industry produces two to three big movies a year, budgeted at above $20M. And if people come to the theaters not just to eat popcorn, but to enjoy the movie itself, the entire industry will benefit from it – from art houses to indie productions to blockbuster ones. Kirill: On one hand a lot of stories are universal and not confined to the specific culture, but on the other hand there’s the language barrier. I remember watching Marion Cotillard perform in “Two Days, One Night” a couple of years ago, and it was hard to focus on her performance as I kept on glancing at the subtitles. And perhaps it wouldn’t feel very natural to watch a movie done by local actors speaking in English. Mikhail: My impression is that in US moviegoers shy away from foreign productions that have subtitles. As far as I know it’s very similar in Russia. We have around 130 theaters (600 screens) in Moscow, and only around five of them show foreign movies with subtitles, preserving the original spoken language. The rest are dubbed – American, French, Chinese and others. I think that it greatly reduces the value of a movie. It simply removes the full force of an actor. It might work well for action movies like Batman, but I still prefer to hear the original voices. Kirill: There are very few foreign non-English movies that get wide releases in US as far as I can tell. “Crouching Tiger, Hidden Dragon” was a very noticeable exception. And then something like “The Girl with the Dragon Tattoo” that was a movie trilogy in Sweden gets a local remake. Perhaps it’s because people come to a movie theater to relax and enjoy the show, even if it’s not necessary a blockbuster action movie. Mikhail: Especially if there’s a lot of dialog in it. I think that every movie will find its audience. You mentioned remakes and it reminded me of Michael Haneke. He did the original “Funny Games” in 1997 in Austria, and then did a US remake in 2007 with Naomi Watts. And even though it was almost identical as far as the scenes, they were two different movies. Each one is good on its own, and I can’t even choose which one I like more. Some prefer the Swedish version of “The Girl with the Dragon Tattoo”. I think David Fincher’s version was great. We have one indie movie theater in Moscow that is targeting cinephiles. They don’t sell popcorn, and it only shows movies in the original language. It’s almost always sold out because people want to see the original version. I wanted to show “Miss Julie” there, and I hired a crew of translators and editors to work on the Russian subtitles for it, going back to the original translations of August Strindberg’s play from the 19th century. I think that perhaps a third of the people that I’ve invited could have watched it without the subtitles, even despite the heavy Irish accents. There’s a lot of dialogue in the film, and a lot of people in the audience had to read the subtitles. I was expecting to hear people complaining that the film was subbed and not dubbed, but everybody told me that they really enjoyed it. Kirill: Perhaps, as you said, actor’s performance is not just facial emotions and body language, but their command of the voice. Even if it’s dubbed professionally, I don’t think that they’d be able to precisely carry over the original emotions, especially if there’s a single male and a single female voice doing dubbing for all the actors. Mikhail: I agree. There’s also an option to do voice-over, when you hear the original voices, and on top of that you have a monotonous translation from a single voice. It adds a layer that you simply consume, and I think that works better. Andrey Zvyagintsev told me a story about going to Italy to watch a premiere of “The Return”. He said that he almost fainted when he went inside the theater, hearing the dubbed dialogue between the two boys in Italian. It’s a completely different carrier, a completely different energy. He said that for him it was a completely different movie. For him there was no way for those boys to be talking like that, even it worked for the local Italian audience. Kirill: Each spoken language has its own energy. Perhaps Italian and Spanish are more spirited, and German is more clipped. Doing voice dubbing might change the entire atmosphere of a movie. Mikhail: I think so. I wouldn’t use the word “energy”, but it changes how a movie is perceived. Each movie has its own rhythm built into it by its creator. There’s a visual rhythm, and there’s an acoustic rhythm. It feels strange to watch a movie from one culture dubbed to a different language. It breaks the harmony of the entire movie. I remember watching the Turkish “Winter Sleep” that won Palme d’Or at the 2014 Cannes Film Festival. It felt wrong watching it with Russian dubbing, at least for me. It was so much better and more complete with the original voices. Kirill: If I as a viewer only watch movies from one culture or only movies in one language, do you think that I limit myself unnecessarily? Should we be more open to watching a variety of stories from all over the world? Mikhail: My English is far from perfection, but when I was finally able to read scripts in English, I saw that it was completely different. There was something that I didn’t know until then, until I got exposed to the rhythms of that culture. I couldn’t imagine myself being on a multi-cultural movie set, with a Norwegian director, a Danish second unit director, an Irish gaffer and a British focus puller. I think that every contact with a different culture enriches us. Kirill: Was it difficult for you to work on such a set from the cultural perspective? Mikhail: “Miss Julie” was my first international production at that scale. I spent around two weeks in Belgium and France when we worked on “The Banishment”, and then, also with Andrey, we did a short segment for “New York, I Love You” in NY. English language brought everybody together on the set. We met a few times before pre-production to scout the locations. Then we had three weeks of prep in Enniskillen, and I got used to speaking and even thinking in English by the end of it. When you’re in such an environment, you don’t have a choice really. We’ve had a few differences that were noticeable between Russian and European cinema, but that was more on a positive side. Once I came back home, I started using those bits and pieces in my work here. It’s less about the technical side of things like camera or lighting, but rather more about the process itself. I remember back in Belgium when Andrey and I spent a lot of time walking around looking for just the right spot for the camera, with my key grip Boris Bourgois standing to the side watching us. After about ten minutes I knelt down and we nodded to each other, and somehow Boris understood that this was the place. In just a few seconds we had a chalk mark on that spot and he also measured the distance from the ground to the lens. That was the first time it happened to me. Of course today that’s a given for me, but back then it was my first exposure to the European work ethic. And it changed my attitude to the people and the process. I think everybody loves what they do on set, and they are not shy about showing it. I simply don’t see people that are bored of being there on the set, or people that are only interested in a particular narrow thing that they are doing. In Russia you might see the director or the cinematographer asking the actors to move away from the table and then moving that table a couple of feet to the side. But if you do that in Ireland, somebody will come over and very politely ask you if they were too far away to do that. There is no aggression in that, but people tell you that that’s what they’re there for. They ask you to not forget about them, to tell them what you need to be done. Back then I was charmed by that. Kirill: What interested me in “Miss Julie” was that it has only four actors, one of whom was the little girl that appeared only at the very beginning, as well as a very closed environment of the house and the surrounding land. Is it keep the viewer visually interested in what is happening when you have so few places to shoot in? Mikhail: This was one of the things that I’ve discussed with the director Liv Ullmann. She worked in theater, and she trusted me to take the script and make its theatrical setup disappear in a more cinematic language. There was nothing extraordinary, and the concept was rather simple. We wanted to give actors an opportunity to live in that space without moving them or the camera all the time. The main kitchen set was pre-lit in such a way that all the light sources were outside. The sources placed inside were supporting the candles and oil lamps, and the rest were outside the three windows. This allowed us to dim, add diffusion, make them cooler as the script progressed into the night or warmer during the day. Apart from the very first scene with the girl, everything happens in the span of 24 hours, and everything happens in that one space. And the lighting progressed from daylight, to evening, to twilight, to magic hour, to blue hour, to wolf hour, into the night, to pink light of pre-dawn, and then into the sunrise and the final scene. The original script that this movie is based on is happening in Norway during the period of white nights. The sun sets, but the sky is still light, and we had discussions with Liv about that. Even though our story is happening on a midsummer night in Ireland, she wanted to bring over a Norwegian white night into it. This is how we ended up with a night that wasn’t dark. Going back to your question, the decision was to give actors all the freedom to make the camera move with them instead of the other way around. When the camera moves, it is because one of our actors moved and we had to keep them in the frame. And the rest were set up in such a way so that it would hold the viewer in the story without too many cuts or edits. Top – photograph taken on set after the set up and graded the way it was meant to be. Bottom – the final look in the film. Courtesy of Mikhail Krichman. Kirill: Was it any different working with only three actors (apart from the girl in the very first scene)? Mikhail: I wouldn’t say that it was harder or easier, but it was certainly different. It might indeed be a bit harder because there’s this voice in your head that tells you to keep the shots interesting. But you need to be careful and stop yourself from focusing on the entertainment angle all the time. If the story doesn’t require it, you don’t want to be too dynamic. You don’t want to start moving, panning or zooming the camera too much. Pretty much the only tool at our disposal on “Miss Julie” was playing with lighting. I don’t know how much of it is seen on the screen, but we’ve spent a lot of time on that. I have the script in front of me right now, and every page has notes on how the light should change throughout it. Some of it might have been toned down during the grading and it’s not very noticeable, but it’s still there. To illustrate it, there is a scene in the end of the film. Miss Julie and John are in the kitchen in the early morning in a dull light. Suddenly the sun comes from behind the cloud and shines brightly through the windows as she turns her face to it. Kirill: I personally find it fascinating watching a movie based on a book that I’ve read. It is so interesting to see a story that was told through the characters’ inner thoughts and old memories being adapted for the screen, which has a different set of tools to tell the same story. Would you say that some part of your job on the set is that of a psychologist that translates those written thoughts and emotions into the visual language tools at your disposal? Mikhail: It would be interesting to come up with an alphabet or a dictionary that would provide such building blocks for conveying certain things. I don’t think that such a thing exist, even if only because really great literature doesn’t spell out everything. It wakes you up and plants seeds, and then makes you express things in your own way. I love a well-written script, no matter if it’s based on an existing book or if it’s an original one. Much like a great book, it stirs up emotions in you. If it’s written in a dry way, you look at it as a document, as a statement of intentions; it just spells out movements for people that say some things. I think that it’s hard to take great literature and adapt it for a screen. I can’t think of that many great adaptations. There are certainly some, but you might be able to count them on your fingers. It may be because people are trying to stay too close to the original, and that’s a trap. It may be because people have not found their way yet. A great book that captured you, that stirred some thoughts and energy, and you’re ready to make something out of that, something that becomes your own – that’s when it makes sense. And that happens between the script writer and the director, adapting the original book and making it into a script that eventually makes it way to me. 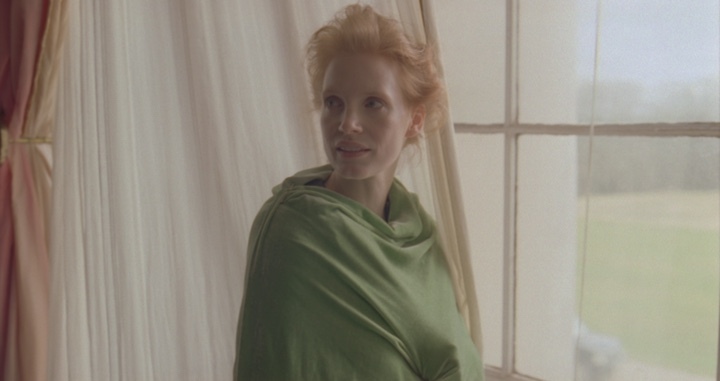 If we’re talking about “Miss Julie” and the original work by August Strindberg, I think it was done well. I read the translated original and the script in English. Some of the original scenes were omitted by Liv, but I think that what you see on the screen certainly has Strindberg in it. Kirill: Maybe, like you said, a great script doesn’t slavishly follow the book. Instead, it takes the core of the story and adapts it to be told through the tools of the screen as the medium. Mikhail: Certainly these two are different mediums, and they use completely different tools. I agree with that. 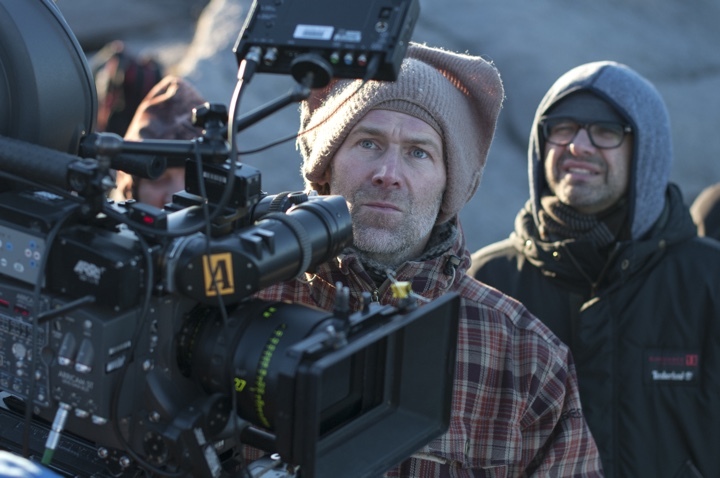 Kirill: On the set you have your camera, all the equipment around it and the people taking care of all of that. 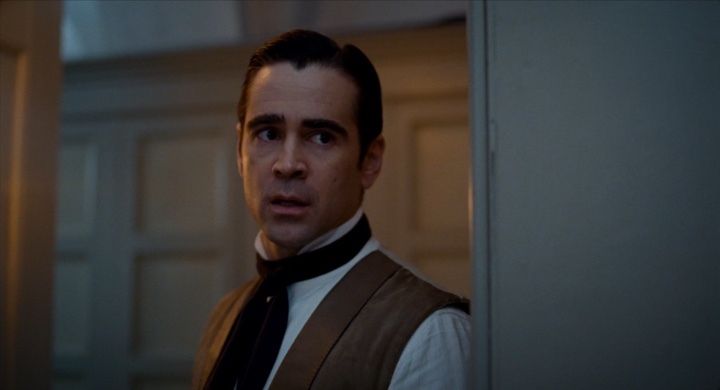 On such an emotionally charged movie as “Miss Julie” that requires actors to play with raw emotions, how do you minimize the distraction that the crew and the equipment bring to the set? Mikhail: I think that’s important for all film productions, at least the ones I’ve worked on so far. The camera captures the dialog that is brought to it by the director and the actors. You need to make it comfortable for the actors to deliver a difficult scene. 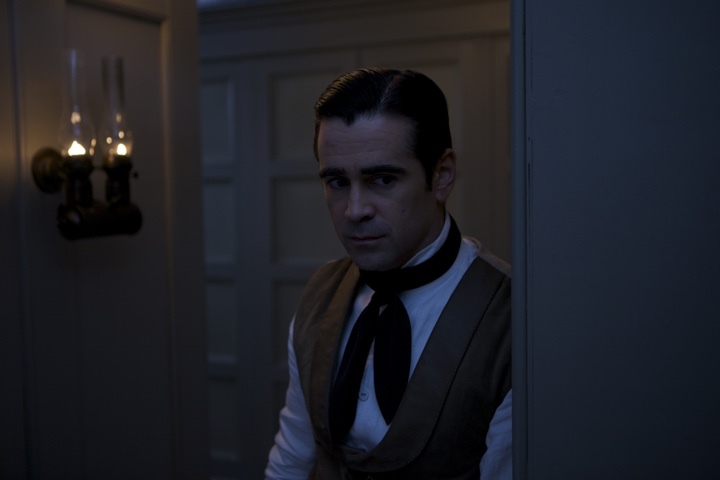 I have no doubt that actors at the level of Colin Farrell and Jessica Chastain are used to working in any conditions. But even though I think that they can deliver a scene even when there’s a lot of people around them, I agree with the premise of your question. When the emotions run high and the actors are completely focused on what they’re doing, there shouldn’t be any distractions whatsoever to bring them out of that state. Whether you want it or not, things don’t go sequentially. We did try to shoot the scenes in their time order, and it was great to have the actors with us at all times. You keep on doing the same scene again and again, and every time it’s different. It doesn’t matter how experienced the actor is, every noise, every glance, every extra person that comes on the set become a distraction. The fewer people you have on the set, the better it is, unless they are absolutely needed there. I keep my department as small as it can be. I also prefer to operate the camera, and I don’t think that we had any of these excesses on our set. Everybody that was there was doing something. Sometimes Liv asked some people to leave, not by forcing them, but rather by making them decide if they were absolutely needed to be there at that particular time. 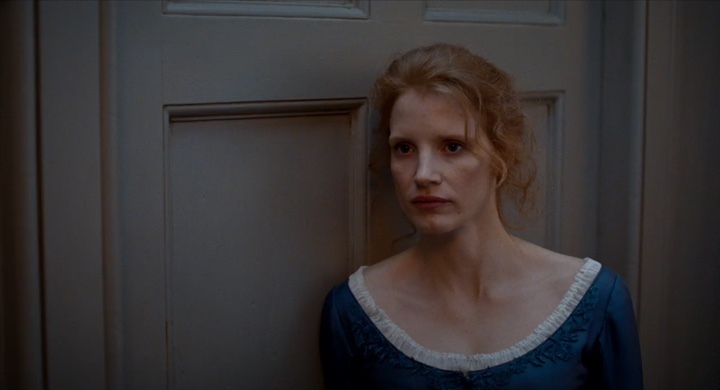 From test shoots of “Miss Julie”. Courtesy of Mikhail Krichman. Kirill: Going back to the technical side of things, what are your thoughts on the transition from film to digital? My impression from a few years ago was that digital cameras were not yet at the same level, not being able to match the full spectrum of light stops, blowing out the white and failing to capture details in the shadows. How are things looking these days? Mikhail: I think that talking about film as the “pure” medium is demagoguery. You can shoot a movie with an iPhone. It might be taking it to the extreme, but it doesn’t matter. If it serves the story and reveals it in a descent way, it doesn’t matter what kind of equipment you’re using. Going back to “Miss Julie” that we did back in 2013, digital was everywhere, and film labs kept on melting away. But Liv wanted to shoot it on film. It is partially connected to her background and her relationship with Ingmar Bergman. When he did “Saraband” in 2003, the production forced him to shoot it on video. Liv told me that she remembers what a shock it was for him to not be doing that on film. 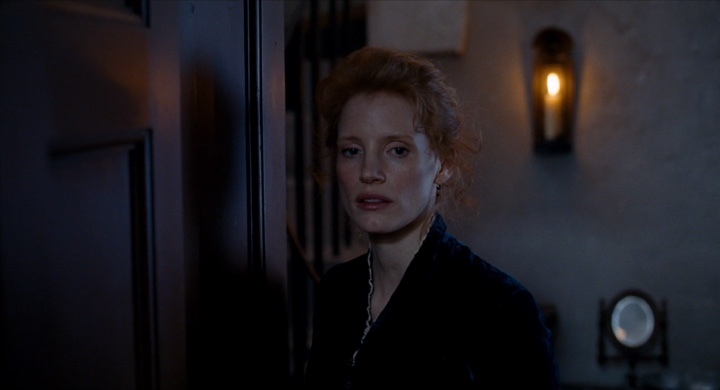 On “Miss Julie” we had a lot of flames, and different kinds of flames behaved differently on digital back then. I didn’t want it to draw too much attention to itself, as sometimes it became red and sometimes greener. So we decided to shoot a very simple test, as we just had our actors joining us. We took two cameras, one digital and one film, and shot Jessica going from her room at the end of the dark hallway towards us and a brightly lit window with trees and sky visible behind her profile shot. And the second shot was just her sitting by a candle. Then we sent it over to London, as a lot of labs were shut down by then. We went there ourselves as well, and film was an obvious winner. The shadows were very dull and you could see red grain, and when she got to the window, there was no detail in the sky. It was blown out completely on digital. And film had all the details. Kirill: So that was three years ago. Mikhail: Yes, we did it in spring 2013. So that was our proof, mostly on the artistic side, and I have to commend the producers for agreeing with us, even though they were reluctant at first. If my memory serves me right, The Swedish Film Institute was responsible for that decision. We had two representatives from there listening to our arguments, and as they agreed with us, one of them told us that we’d have only 1,000 meters a day. Liv became a bit anxious about this number that might sound too low to a person that is not deeply involved in the technical details of it. She wanted to have long takes and give freedom to the actors, and I told her about one of my earlier productions where we had a grant from Kodak giving us an enormous amount of film. I remember film flowing like a river. Not that we didn’t stop the camera on purpose; it was just that we were doing as many takes as we thought were needed. And even then it was a very rare day where we’d get to 1,000 or at most 1,200 meters a day. That’s what I told Liv. Also, we were shooting at the aspect ratio of 1.85:1, and that allowed us using only three film perforations per frame instead of four. That’s what the film camera that we had allowed us to do, giving us extra 25% on every film magazine, bringing it from 10 minutes to 12,5. Kirill: And 1,000 meters were enough at the end. Mikhail: More than enough. Liv almost never made more than four takes of a scene. Kirill: As you said, a film magazine is usually around 10-12 minutes, and then you had to change it. Do you think that it was easier for the actors – to have those breaks in between the takes? Mikhail: I don’t agree with people saying that shooting digital can go for much longer periods of time. I think that such thoughts are more emotionally colored than rooted in reality. Changing a flash card takes time, and you need to reboot a digital camera to change the shooting speed as well. People also want to tend in raw format to get the most information out of the shot, and you keep on going higher and higher in resolution which is these days around 6K. All of that creates so much information that you need to change a regular card after 10-15 minutes, perhaps you’d get 30-45 minutes depending on the type of the camera and a card. If you’re talking about actors and the need for breaks, if they need it, they really need it. That is not related to the technical aspects of changing a magazine or a flash card. Also, I think that if an actor gets deep into the zone, they would want to stay there until it’s done and not be disturbed and taken out of it. You might have a longer scene that goes for, let’s say, five minutes. 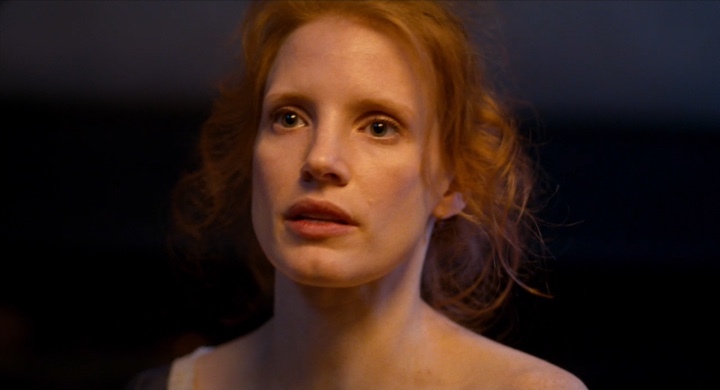 I was amazed to see Jessica and Colin remembering that much dialogue on “Miss Julie”. Every once in a while they had a dialect coach came over to talk with them, but it was usually about the accent or a word that was out of place. When I was working with my translators for that screening that I talked about, they told me that both Jessica and Samantha followed the script 99.9% of the time. And while Colin allowed himself some minimal deviations, it just goes to show how good the actors at that level are at memorizing the lines. I don’t think that they’d be welcoming more interruptions as something helpful. Kirill: But you still had to change the magazines every 10-12 minutes. Mikhail: If you go back twenty years, that’s simply a given. You just had to live with that on the set. And that’s OK because there’s a lot of stress, emotionally and psychologically. Now that digital is here, it’s simply different. Digital has been here for almost ten years, and I think that feature directors have a more disciplined approach. Things might be different on commercials, and if you’re waiting for some kind of a stunt to happen, you just turn the camera on and wait, so that you don’t miss it. Directors know that they will have to deal with all the takes later on during editing. They know that while they can take twenty takes, it’s much better to remain more focused. Kirill: As a cinematographer, do you get to stay on post-production? Mikhail: Most of the time it’s just the director and the editor. Sometimes I ask to be involved with a project from a very early stage, and I generally prefer a flat fee. I think that the more time I stay on a project, the better it turns out to be. We can meet with the director and the production designer, discuss things, scout locations and check the sets. A director may decide to show me their first cut, to get some feedback on that. And then, of course, I enjoy the grading. Kirill: The world of making movies might sound glamorous, but there are certainly some sides that make it a bit less appealing, such as long weeks and months spent away from the family, unpredictable schedules and the overall pressure to finish a project. What, in your opinion, makes people stay in the industry? Mikhail: Speaking for myself, each movie that I’m making is a new discovery, even if I’m working with a director that I’ve already worked before. It’s a new script, and it’s always a new river. This September I’m starting to work on a new project with Andrey Zvyagintsev, and as we started talking about it, we both agreed that it doesn’t matter how many movies we already did together. It doesn’t become easier. It might be even getting harder to some extent. Kirill: To not repeat yourself? Mikhail: Partially yes. It is a trap though, in a certain sense. You might start running away from repeating yourself, but you always want to take the script and use the right tools to make it happen on the screen. Otherwise, like we say here, you’re trying to scratch your left ear with your right elbow. It’s just wrong. Going back to your previous question, I can’t really tell you which part of the overall experience I like more, from pre-production to shooting to color grading. Each one has its own happy moments. It boils down to being able to express yourself. When you’re deep down in the prep, or in the middle of shooting on a set, you see that you’re doing something that is going to stay afterwards, something that is close to your heart, something that will resonate with somebody else. And there’s always the thrill of feeling you’re doing something new, not necessarily from the point of view of technology. You spend your time working on something, which might even be at your desk during the prep, and as you get into the zone, you realize that you’re getting close to creating something that you haven’t created yet, and there’s a chance that it will turn out well. It’s a great feeling that keeps you going. Kirill: As you sit in the theater to watch a movie, can you relax and get immersed in the story, or do you find yourself analyzing the technical aspects of your particular field? Mikhail: If we’re talking about films that I didn’t work on, I’m more of a grateful viewer. I rarely pay attention to the technical aspects on the first viewing. I’d have to go and watch it one more time if it’s a good movie. As for my own productions, I think that if a shot is in the final cut, it means that the director chose to include it. 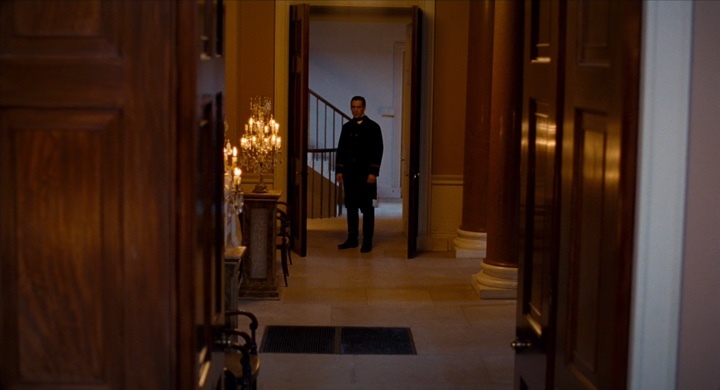 I’m not ever going to ask the director to not include a certain shot, because of a bad dolly move or off-beat focus. That’s up to the director to decide. I’m in the theater to watch a movie as a viewer, and if I like it, that’s what I take with me when it’s over. “Miss Julie” caught up with me only here in Moscow, to tell you the truth. It sounds strange a bit. I saw the first cut when Liv had just completed it, and then I saw it after the color correction pass – all back in late 2013. I knew almost the entire script by heart, because I heard it again and again during the rehearsals and the shoots. But it was only during that screening in Moscow that we talked about earlier that the movie finally got deep into me. When we were doing the subtitles and I watched it again, that’s when I saw it in a different light. Maybe it was because I was so focused on this particular aspect of it. Maybe it was because it was just me without the rest of the original crew, even though we had great chemistry with the translators and the editors of the subtitles. It was the day before, when I was sitting down at home watching the final subbed version, and it was completely different. Even though that was probably the tenth time of so that I watched it. I try to make movies interesting for the viewer, as much as I can contribute to that. Kirill: Maybe when you start paying attention to the technical details, it’s a sign that the story is either not good or it’s not being told well. Mikhail: The worst compliment I can get is to hear that a movie was shot well. At least if that’s the only opinion a person has about that movie [laughs]. It sounds like the cinematographer stood apart from the rest of the crew, doing just his or her job and not contributing anything to the story. It’s this one thing that everybody should be working on together. 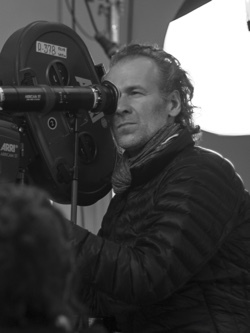 And here I’d like to thank Mikhail Krichman for graciously agreeing to answer a few questions I had on the craft of cinematography and on what went into creating the wonderful world of “Miss Julie”. Background materials for the interview were provided by Mikhail. If you want to know more about how films and TV shows are made, click here for additional in-depth interviews in this series.